This will be the final post (concerning Brazil) to promote our recent report on Land-Use and Agricultural Emissions in Brazil and Indonesia. I encourage all to read through the report to gain a more detailed understanding of the current emissions situations in these two countries, current initiatives to reduce initiatives, and finally barriers to mitigation and recommendations to overcome these barriers. This post will outlines some of the major barriers in Brazil and list some of our policy recommendations to overcome them. Clearly this list is not exhaustive but provides a starting point for policymakers, civil society, and other international stakeholders to push Brazil toward its emissions reductions goals. (1) A lack of coordination among existing REDD+ initiatives and the different levels of government. This puts the overall success of REDD+ in jeopardy as criteria, rules, and safeguards cannot be properly set up without policy harmonization among different levels of government. (2) Uncertainty about the future of the Forest Code has weakened law enforcement for illegal logging and farm expansion. Scrapping the code could incentivize more illegal behavior and undermine law enforcement systems that have taken decades to put in place. (3) Cattle ranching companies and agribusinesses form an immensely powerful lobby in Brazil, most notably at the state level. Many of the country’s most powerful political actors are somehow linked to one or more of these industries, leading to a policy environment that favors these businesses. (4) Carbon markets, REDD+ initiatives, and payments for environmental services face severe barriers in Brazil. REDD+ does not directly fund local level projects. It only allocates money at the federal level to set up jurisdictional facilities at the state level that will make countries REDD ready. Poor implementation of the jurisdictional facilities has resulted in a loss of producer and investor confidence that these systems will provide incentives to maintain forests on private land. The pillar of REDD+ is good governance and the key to systems that deal with carbon credits is figuring out how to share the benefits fairly throughout a society. Brazil has yet to accomplish this. (5) In general, Brazils public agencies that are supposed to provide technical assistance in implementing sustainable land use and agricultural practices are understaffed and lack the proper structural organization to train producers that do not belong to large scale agribusiness companies. For example, the Brazilian Agriculture and Livestock Research Agency (EMBRAPA), despite its high quality research, has been unable to influence small to medium farmer practices. (6) Lack of publicity for EMBRAPA’s field research studies and practices has made dissemination of information difficult. Producers who want to take part in the ABC Plan face information gaps and lack of technical assistance in monitoring and evaluating their projects. This, along with implementation costs, is an extremely significant barrier. (7) Access to credit and affordable financing instruments remain largely unavailable for small to medium farmers. In addition, complicated and inefficient loan requirements by the Brazilian Development Bank (BNDES) hinder implementation of the Low-Carbon Agricultural Plan (ABC Plan). (1) Brazil must improve the ABCPlan by implementing a monitoring and evaluation group for the Plan. 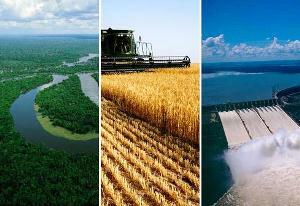 BNDES should revise ABC loan criteria by lowering interest rates for farmers who comply with environmental legislation. (2) Improve public training and education efforts in Brazil to promote low-carbon practices for producers (small and large). Providing micro-credits for financing new techniques/technologies for smallholders can change farmer behavior. (3) Coordination between agribusiness and government in both countries to create sustainable supply chain standards, especially for the beef and soy industries. This could include providing economic incentives for firms complying with environmental recommendations and sustainable product labeling. This has begun to take off with the ABIOVE Soy Moratorium and the Global Roundtable for Sustainable Beef. (4) Increased funding for forest monitoring and law enforcement. Brazil has made strides in monitoring with a sophisticated Landsat system but more enforcement is needed to protect the Forest Code, the PPCDAm, and the PPCerrado. (5) Improved policy transparency and inclusion of civil society/NGO/ relevant stakeholders in the process. Transparent governance and inclusion of stakeholders will create dialogue to identify where the largest strides can be made. This process could realistically have a positive impact on the climate and environmental preservation debate, especially if more pro-climate voices are included. This is one especially effective way to improve carbon market benefit sharing. Again, these lists are only a jumping off point that barely scratch the surface of the issues and intricacies contributing to land-use and agriculture emissions in Brazil. For more detailed analysis, refer to our soon to been released report and let use know what you think.